Cesena - According to test match for the national team of Milena Bertolini in a "Manuzzi" whitened by the snow, the match was anticipated at 16 due to bad weather forecast, but started with a quarter of an hour delay to allow practicability of the field. The CT confirms the ownership to five-eleventh of the formation lined up against Chile proposing a 4-4-2 with Pipitone between the poles, in defense Guagni and Bartoli side with Linari and captain Gama in the middle, on the median the duo Galli-Giugliano, with Bonansea and Bergamaschi on the wings to support Mauro and Sabatino in phase offensive. Therefore, lines dyed red, fluorescent yellow ball, and snow on the field that will penalize the game on the ground, especially for most of the first part of the game, will therefore be justified by several errors by the two teams. Start the match with the typical ball possession that characterizes our national team, immediately an opportunity for Italy at 8 'with Bartoli served with an excellent filter from Giugliano, the Romanist tries with a shot from the left but finds Williams to save on the line. Italy, however, in percussion with the ball that is almost always in the three quarters Welsh: we are at 14 'the snow starts to fall after a little' subsided, on the median Giugliano that launches Guagni on the band, the same after a lightning progression , brushes a perfect cross for Mauro who stands out with a header and beats O'Sullivan, is 1-0 Italy. After the blue goal they try to react to the Welsh with some jolt but always find the rear attentive blue, in particular thanks to the omnipresent Guagni who leans on the right wing with excellent freshness and the central Linari that often has the best on Jones. The race continues without any noteworthy episodes, until the half of the first part of the race when the "Reds" find a slight mastery of the field, never had before thanks to the aggressiveness shown by our start as Bertolini wanted, so is Fishlock who tries to serve a partner with a filter but the ball is slowed by the snow in the middle of the area, there is an uncertainty between Pipitone and Bartoli, the latter avoids the back pass to the goalkeeper and stands between the opponent and the ball , waiting for the companion to grab her, but the extreme blue defender does not succeed, so Harding steals her, but being back to the door, she returns it to Fishlock, who tries a shot, finding a careful Pipitone this time, Italy gives a little the pace, but at the 31 'there is Guagni that launches Bergamaschi on its own band, the same readily exploits the error of Evans, also accomplice here the snow, managing to make a good cross for Sabatino, but not im draws the ball well and points it high above the crossbar. At the minute 34 is again Guagni to anticipate Jones to serve Bonansea who proposes from the left a passage to the center area, but gets dirty by a Welsh defender first and then Ingle who can not postpone it altogether, allowing an assist to Sabatino that misses a conclusion in front of the door: striking too much of outside it comes out a completely oversized shot. Immediately after Bergamaschi, who had grown up during the race (an exciting duel with Evans), he concluded a little to the side with a diagonal to the right of the goalkeeper. At the 36 'a mistake by Giugliano allows a shot from afar Fishlock who tries to surprise Pipitone with a lob, but the Giallorossi goalkeeper to the chest, almost to taunt the opponent, receiving the applause of the public cesenate. We are around the 40 'almost no snow, now you notice much more the green hue of the playing field unlike the beginning of the race when the white prevailed, at this moment there is more Wales in the offensive phase that must commit careful Gama and his department: a shot by Fishlock seriously engages Pipitone who deflects in a corner kick with an excellent flicker. But at the best moment of Ludlow's training Ilaria Mauro thinks to double with an authentic masterpiece: it's the 44 'when Fishlock in the restart phase slightly elongates the ball, Ilaria believes it and from the attacker of the race he pounces against it and steals it , advances a little and with a spoon mockery the goalkeeper overtaking him, internal cross and goal! It ends the first half on the 2-0. At the restart Bertolini sends Girelli for Mauro, Fusetti for Linari, Boattin for Guagni, does not change the pattern, during the break some snow has been removed and the game will also benefit. It is now Italy at the 50 'cross of Bergamaschi for Giugliano that hurts badly, Bonansea recovers but ends high, shortly after Giugliano's excellent saber for Bonansea who exploits his own speed but finding himself face to face with O'Sullivan, the latter has the better; for a moment we leave out the news for a curiosity: the Welsh goalkeeper 27enne played this role for only four years, former defender, was declared a player of the year in the 2017. Let's go back to the match and signal the dominion in the field of Italy first with the escape of Bergamaschi serving Girelli who almost realizes the third goal, then sequence of shots always beaten by Sabatino, Bonansea and Galli and then again Sabatino that from distance close too open the compass sending to the side. First change for Wales: Jones takes over from Ward and shortly after responds Bertolini with Cernoia for Galli, who at 68 'almost ends in the net found in front of O'Sullivan thanks to a suggestion of Bonansea, but the former defender denies the joy of the goal, at the 69 'Bertolini plays again the Tarenzi card, detecting a Sabatino today opaque, trying again the coup de grace with the clivense like in Empoli. At the 75 'uncertainty of Pipitone who under pressure is under pressure from Hughes and Harding, almost no surprise but in the end manages to remedy. Two more changes for the wales and shortly after it is debut for the 22enne Sassuolo Bursi that replaces Bartoli, the final race and Welsh brand that proudly tries first with Ingle and then with James. At the 4 minute of triple recovery whistle Serbian referee Visnjic. It ends 2-0 for Italy in front of 1000 spectators around, reached Manuzzi in the snow, with the temperature around zero to support the national team, a satisfying number of presences for a growing movement. In hot Bertolini will be satisfied with the performance of their girls in all departments in spite of the environmental condition more Nordic away, adding to want to do better than last year in the upcoming Cyprus Cup, (that would be tantamount to winning it ed) and that the same will also serve to give more space to those who have played less so far. In conclusion we have witnessed an excellent performance of the blue that increase the expectations for a world of protagonists: almost never seriously committed Pipitone, today deployed as an alternative to Marchitelli to give a chance to her among the poles, an excellent Mauro author of a capital contest thanks to his double, an omnipresent Guagni, precise and worthy of the recent recognition of a player of the year assigned to him, excellent Bergamaschi, also good evidence of Linari, Gama, Galli and Giugliano even if a bit 'sin in the final stage , the proof of Bonansea was a little misty, but Sabatino did not. It is hoped that this national has the right media recognition soon and that it is therefore possible to simply turn on the TV, tune in to any station and follow the exploits of these wonderful girls, because today you can only do it on Facebook and / or Youtube . 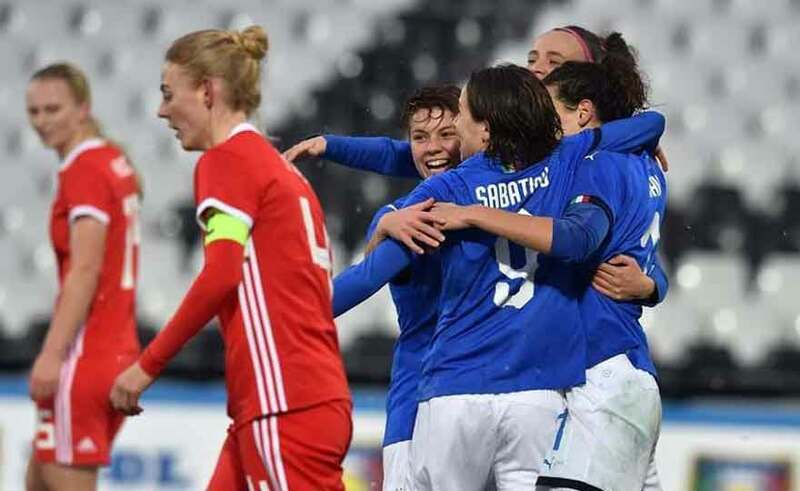 Italy (4-4-2): Pipitone, Bartoli (80 'Bursi), Linari (46' Fusetti), Gama (cap), Guagni (46 'Boattin), Giugliano, Galli (65' Cernoia), Bergamaschi, Bonansea, Mauro (46 'Girelli), Sabatino (70' Tarenzi). Available: Marchitelli, Schroffenegger, Giacinti, Mascarello, Serturini, Bonfantini. All: Bertolini. Wales (3-4-3): O'Sullivan (76 'Skinner), Evans, Ingle (cap), Roberts (76' Dykes), James, Fishlock, Ladd, Williams, Harding (76'Davies), Jones (63 ' Ward), Hughes (85 'Horrel). Available: Lawrence, Nolan, Estcourt, Filbey, Wynne, Powell. All: Ludlow. Special correspondent on the field of AS Roma. Follow the national teams.